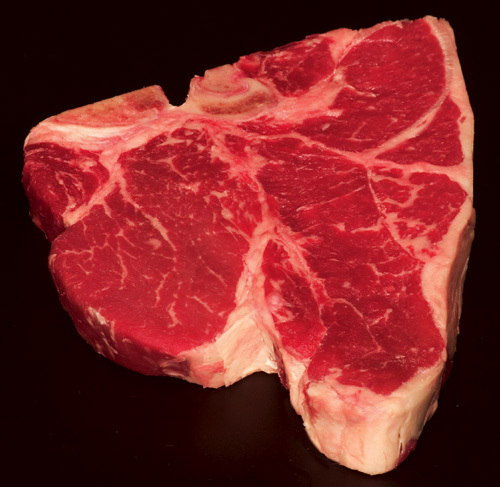 You have probably eaten a prime porterhouse steak somewhere in your past. In case not, here is what it looks like. It comes from the part of the cow known as the “Short Loin”. 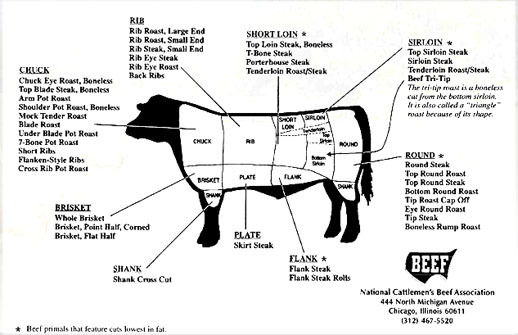 See for yourself in the primal cuts diagram, courtesy of the Cattlemen’s Association. Wow, the Cattlemen claim porterhouse is low in fat. Perhaps it is even healthy. What could be better? 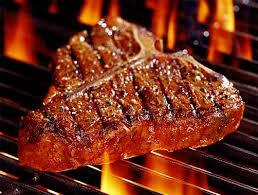 What is better is how good that steak tasted! We purchased our porterhouse at the Meetinghouse Deli, in Jamesport, NY. You can read about our visit right here. There were two other choices in the case, sirloin and rib eye. We had sirloin and rib eye recently and chose accordingly. So, here is an interesting question. What is a prime meat case doing in a deli that sells far more “ham and swiss on rye”? It is doing a great job, that’s what. I’ll bet Meetinghouse does a great business in prime meats. In our travels around town, we’ve discovered some great meat cases in some local supermarkets and convenience stores. Here is what we can say with experience and confidence. The IGA in Amagansett has Brian, a first class butcher who runs a first class prime meat counter. You will never go wrong there. Cromer’s Market on Noyac Road in the Sag Harbor area is another winner. Cromer’s supplies the meat case in the One Stop Market in Springs, and The Hampton Market Place near the East Hampton village, so either of those shops would be a good bet for great meat. Of course, you can always visit Citarella in East Hampton or Bridgehampton. But be creative, and try the little guy. Let us know what you learned! For some reason, the deli scene reminded Stu of the butcher shop on his street when he was a child. Minus the sawdust on the floor, it gave him a good feeling about the dinner to come. So, we took our own advice about trying the little guy, and as you will read, we were glad we did. For Stu, meat with bone attached is more flavorful, and it cooks more easily on a grill than in a smoking-hot skillet where the bone limits contact of steak and pan. Anyway, it is summer and for us, that means grilling. Stu likes to place a Lodge griddle on top of his gas grill’s grates. 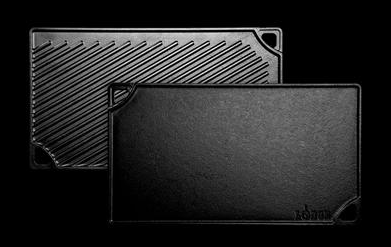 The cast-iron griddle develops an even heat for searing, limits flare-ups from dripping fat, and puts a great set of grill marks on the steak. In winter, the griddle comes inside where it sits neatly over two gas burners on the stove. You can grill in comfort. Our steak needed no preparation, except for some salt and pepper, and a bit of olive oil. Three minutes per side on a hot grill and three minutes standing on end with the bone searing. While letting the steak rest for 10 minutes off heat, Stu finished it with an organic Tuscan herb infused olive oil from Vines & Branches . They have locations in Westhampton Beach, Southampton, and Greenport, so you are pretty much covered. Their oils are delicious and the Tuscan brings out the best in a steak. Guess what… the steak was terrific! Of course, a meal like this one cries out for the right wine companion. 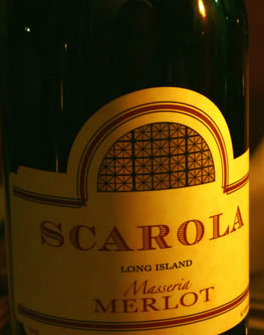 Staying with our North Fork theme, Marian selected a Scarola Masseria Merlot bottled in 2010. 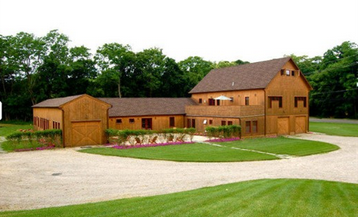 Scarola is a small production Mattituck winery making about 500 cases per year. The Masseria Merlot is 90% Merlot and 10% Cabernet Franc. A beautiful wine drinking beautifully now, it has great acid, with flavors of currants and dried fruit. Expect top notes of violet and bottom notes of spice and leather. We think it is a steal at $20.00 a bottle. By the way, adjacent to the vineyards you will find the Cedar House on Sound B&B. Donna and David Perrin, proprietors of the B&B graciously offered us a tasting and walking tour of their beautiful home. Visit the website to find out about a private tasting and tour. Call ahead before dropping in.